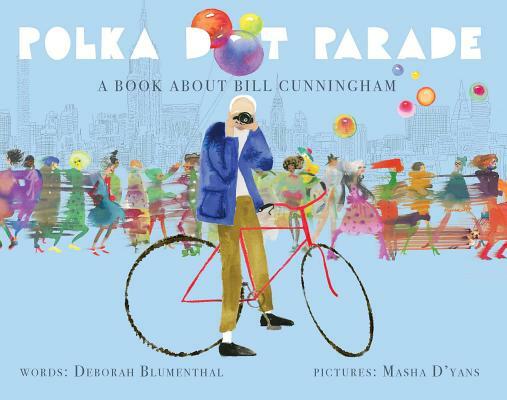 This is a moving and impassioned picture book about the iconic fashion photographer Bill Cunningham that will inspire young readers to go discover their own ideas of beauty and embolden the world with their own creativity! Every day, Bill Cunningham pedaled his bike through New York City searching for beauty. As he took picture after picture, Bill found beauty not in people, but in their clothes. Drawn to bold and creative choices, Bill's photos captured the attention of the New York Times. He traveled to Paris for Fashion Week, and admiration for his work grew. With his sense of creativity and daringness, his own personal style of photography came to be known as street art photography. His photos left a lasting impression on all those who came across his work and they continue to inspire creativity today. This is the story of the legend who created street fashion photography and left behind a legacy of glorious pictures. Bill Cunningham used his passion and talent to capture the beauty he saw in fashion and the ultimate freedom that it represents to each and every person. This is an inspiring picture book about finding your path and being creative. Deborah Blumenthal is an award-winning journalist and nutritionist who now divides her time between writing children's books and adult novels. She has been a regular contributor to the New York Times (including four years as the Sunday New York Times magazine beauty columnist), and a home design columnist for Long Island Newsday. Her health, fitness, beauty, travel, and feature stories have appeared in many other newspapers and national magazines including New York's Daily News, the Washington Post, the Los Angeles Times, Harper's Bazaar, Cosmopolitan, Woman's Day, Family Circle, Self, and Vogue. Blumenthal lives in New York City. You can visit her online at deborahblumenthal.com. Today, her cards can be found in shops the world over. She also styles and designs clothing, as well as a range of products including MoMA's renowned pop-up cards and calendars for Rizzoli. Her work has been featured in numerous movies and TV shows such as Funny People and The Kids Are Alright. Masha's literary portfolio includes book covers like All We Have Left by Wendy Mills, picture books such as A Poem as Big as New York City and Razzle-Dazzle Ruby (which she illustrated, wrote, and paper-engineered), and the coloring book Color Me Enchanted. Originally from Europe, she holds a BFA from Cooper Union. Masha now lives in Los Angeles, California. You can visit her online at masha.com. Masha's vivid watercolor work brings Bill's photos to life. A stunning marriage of two forms of art. The eyes are on a holiday. Well done! Bill Cunningham was a New York treasure and the most beloved photographer and quirky personality in the fashion business. I am so glad Deborah and Masha created this whimsical storybook, exposing our Bill to whole new audience. I miss you, Bill. A picture-book tribute to fashion photographer Bill Cunningham. From fashion and beauty journalist and children's author Blumenthal comes a touching tale of one of New York's most beloved and slightly eccentric fashion icons. With his signature "blue French worker's jacket, tan pants, and black sneakers" and a camera "slung around his neck," for decades Cunningham cycled the streets of Manhattan, seeking both the figures who made fashion and those who consumed and put it proudly on display each day. "He who seeks beauty will find it," said Cunningham, the humble hat maker-turned-photojournalist who single-handedly created the genre of street-fashion photography, presenting the images of regular people and models together in his New York Times photo column "like squares on a story quilt." D'yans' scintillating watercolors, depicting Bill in action on the street or his subjects who "looked like leopards in their leopard prints, ...dudes in dots and spots," perfectly match Cunningham's unassuming edginess with their ragged splashes of brilliant color and deft smear technique that creates a three-dimensional illusion of motion. Seasoning her spare text just so with Cunningham's own voice (sourced in notes), Blumenthal effectively communicates her admiration for her subject. Beautifully rendered and told, the book brings to life the work of a gifted 20th-century artist whose creative vision will always be in vogue.